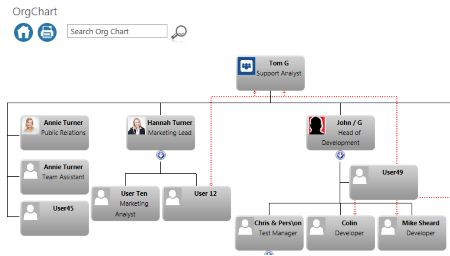 Additional information from the organization chart data source can be displayed within a pop-up dialog that is displayed when the user clicks within a chart box. This guide walks through some of the configuration options. The Information popup dialog is configured out-of-the-box and for a charts using either active directory or the User Profile Service as a data source no additional configuration is usually required. To view the information the end user simply clicks within one of the chart boxes. The information dialog is shown with the default settings. The configuration options for the dialog are contained within the Information Dialog configuration section. 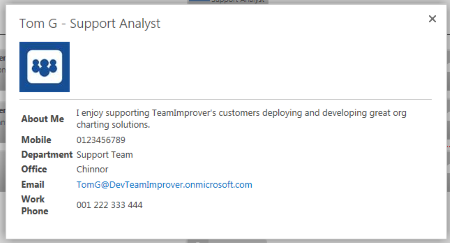 Show Information Popup - enables or disables the information dialog feature. 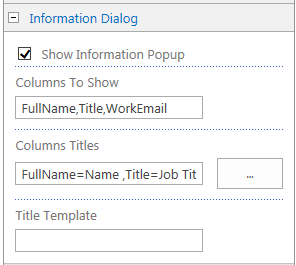 Column Titles - allows field names to be renamed. 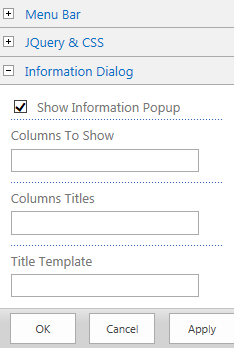 Title Template - Defines which fields will be shown as the dialog title. Enter a list of column names into Columns to Show to set which columns from the source should be shown. 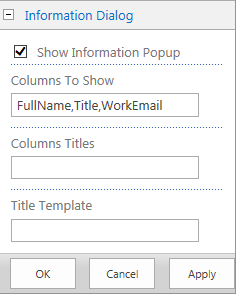 In this example the columns FullName, Title, WorkEmail are being shown from the User Profile Service. Individual Columns can be renamed by setting the Column Titles property. If you are using a SQL database as a data source additional configuration is required. 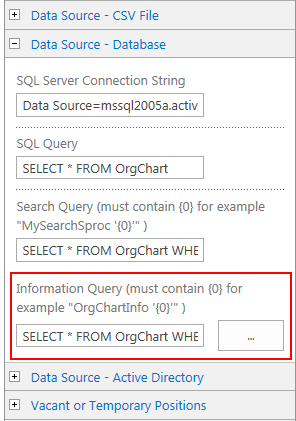 Within the Data Source - Database configuration section you will need to set the Information Query property. This should be either a SQL SELECT statement or Stored Procedure call that will return the information to be displayed within the popup window. The dialog expects a single row to be returned with the appropriate data. 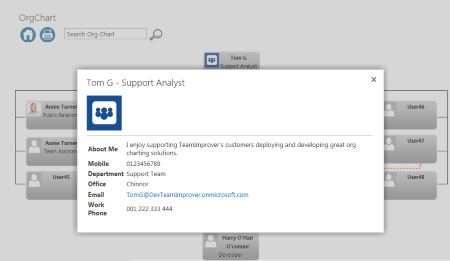 SharePointOrgChart also comes with the Information Panel Web Part. This can be used instead or as well as the Information Popup feature to display further useful information to users.